My friend asked me for help and we only found a solution we don't like 100%. 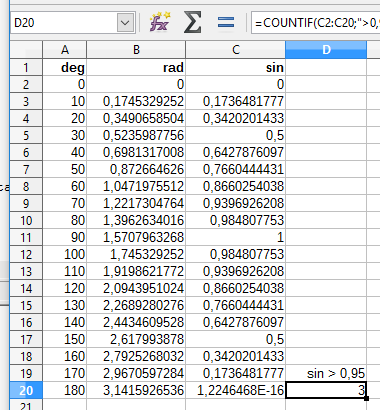 Problem: I have a table with angle values in degrees (0, 10, 20, ..., 180) - that is range A2:A20. I want to use COUNTIF to tell me, how many of these have SIN > 0,95. My solution: In column B I use RADIANS to convert degrees to radians. In column C I calculate the SIN value. Then I can write COUNTIF(C2:C20;">0,95"). I don't like this solution because I had to add two extra columns that hold values I don't need to see, I only have them so that COUNTIF can tell me what I need. The "value" would be the value of the evaluated cell. In ">0,95" you can feel this keyword... "value > 0,95"... but not having it means not being able to apply functions to it. Is there a better solution to my problem?